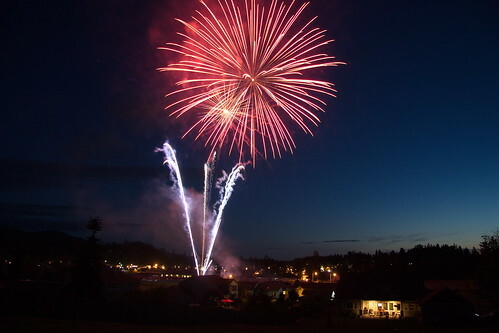 Light over Eatonville I, a photo by The Bacher Family on Flickr. 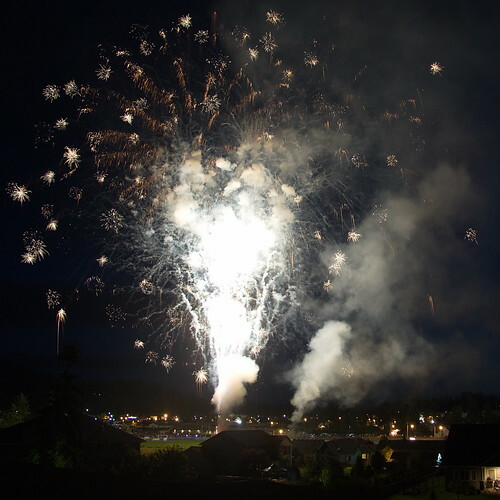 The town of Eatonville, Washington holds its annual fireworks display at the local elementary school on the night of July 3rd. My wife's parents live just up the hill from the school, so we have a perfect view looking out over the town. It was fun experimenting with just the right settings for getting good light streaks -- too long, and it looks like daylight; too short, and you don't capture the streaks of light. I also love the amber lights of the town scattered below the display. In this next picture you have some of both: the scattering bursts of light on the edges, and an awesome display of light in the middle, which also lights up the smoke cloud drifting off to the north.